← Does your auto need new brakes ? my A/C system isn’t blowing cold. Can I cause damage if it continues to operate? My A/C works but the air doesn’t blow out the vents. Are my vents blocked? Will an a/c check and service help me save money on gas? Are you asking these questions ? Are you ready for the summer travel season ? ….Don’t sweat it , service it ! Year after year A2Z Automotive sees many vehicles in the spring which we suggest have an air condition system check and maintenance before it gets hot. Most of our customers do have their car’s maintenance completed on a regular basis however those that do not keep up with the a/c auto maintenance eventually need major a/c repair later in the hot summer months. You should make sure that you auto a/c system is not harming the environment and abides with all federal air conditioning laws. You could try to …. Understand the air conditioning process: The compressor puts the refrigerant under pressure and sends it to the condensing coils. In your car, these coils are generally in front of the radiator. Compressing a gas makes it quite hot. In the condenser, this added heat and the heat the refrigerant picked up in the evaporator is expelled to the air flowing across it from outside the car. When the refrigerant is cooled to its saturation temperature, it will change phase from a gas back into a liquid (this gives off a bundle of heat known as the “latent heat of vaporization”). The liquid then passes through the expansion valve to the evaporator, the coils inside of your car, where it loses pressure that was added to it in the compressor. This causes some of the liquid to change to a low-pressure gas as it cools the remaining liquid. This two-phase mixture enters the evaporator, and the liquid portion of the refrigerant absorbs the heat from the air across the coil and evaporates. Your car’s blower circulates air across the cold evaporator and into the interior. The refrigerant goes back through the cycle again and again. Look for other things that can go wrong: bad switches, bad fuses, broken wires, broken fan belt (preventing the pump from turning), or seal failure inside the compressor. You want to save time,money,and repair cost. 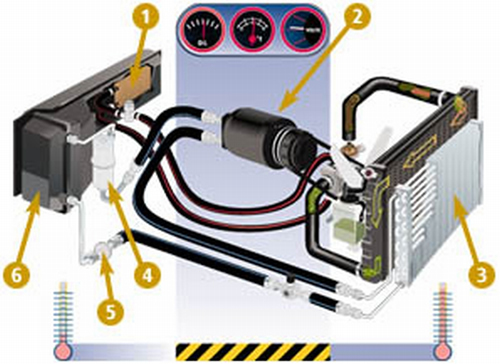 What you should do is consult an auto air conditioning repair shop ! This entry was posted in Auto Repair and tagged a/c, air conditioning system. Bookmark the permalink.